I've been busy the whole past week doing lots of fun things! Nothing serious, or done with a purpose, or any management by objective. Come to think about it, I've been busy busy doing nothing!? I just had this epiphany after eating my moon cake and tea. Have you had this similar experience before? Busy doing nothing? Or have you experienced "a flow" or "in the zone" kind of feeling? I heard the pool was calling me; I swam. I had a food craving; I ate. I wanted to visit this place; I went. Now why can't every week be like this week? LOL! A song that I (and a person who likes oat meals) enjoy very much. If we feel no shame, there's no pain. Does that mean we are perfect? Looking back, I am such a baby. The last one patted my head as I asked for forgiveness in her bosom. She smiled and told me she is training me for the next woman. 13 years my junior, she is a lot more mature than me. It's good to be reminded of our little failings - especially when we think no one is watching. I too am a flawed tulip. Eager to look good on the outside when I present myself to the world; but deep down, I know there's a virus gnawing away at my soul. Although not religious, I like the part of the "turning to a new page" in this video. I guess my reflections and meditations are sort of "confessions" to myself. A way of looking at myself from "outside looking in". What stocks should I buy now? I just read a very interesting summary of the recent Shares Investment Conference from Martin Lee's blog here. "Do you have any stocks or ETFs to consider buying for China or Singapore? I’m not here to do hot tips. If I told you what to buy, you wouldn’t know what to do if the price goes up or down. Because you will not know why you bought it. You will not know it when I sell. For you to listen to anyone about investments, you must be involved with them on a continual basis. If you do not know what to do after what I have told you about where I think are the good areas to invest in, then you shouldn’t invest." Isn't it wonderful this internet thing? Information is "freely" available (more like information overload to me). I wonder how our "qian bei" investors traded and invested during the 70s and 80s!? Talking about stupidity, looking at my trading journal, I sure look dumb dumb - like looking at old pictures of yourself in your yesteryear "gong-gong" hairstyle and most "orbid" fashion threads! The only grace (or edge) is that at least I still can be honest with myself in the still of the night. It's a brand new shinny day! 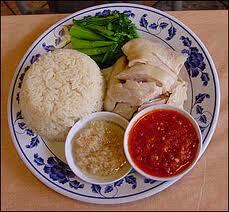 What's your favourite chicken rice stall? OK, keep the answer to yourself (hello, no need to email me OK?). Is it that stall that you frequent all the time near where you stay? Or is it that stall freaking all across the other side of the island, but no matter, you still make an effort on a regular basis to have your regular makan "fix" right? Both answers will put you in the category of opinion leaders. You may want to pause and reflect why you answered the way you do. I've asked what's your favourite; I did not ask who's the most popular. Now what made you do so? OK, for those of you everything has to have a practical value (your're not into intellectual stimulation), you may want apply this exercise to how you invest or trade. Just change the question to: What stock to buy now? If you really care, zip up! In these low interest rate and relatively high inflation times, you often find people (who think they know) expressing shock and surprise when they discover their “friends” or acquaintances still keep the bulk of their money in plain vanilla fixed deposits and savings accounts. Invest in dividend stocks; you can earn more than 6-7% easy! Put your money in passive index funds – look, no brains needed! Buy gold, it’s a great inflation hedge. Even central banks are buying them! Get into the property market now! You can get both rental income and capital gains! And these self-styled man-in-the-street “guru” will walk off without a care in the world. Just making conversation mah! Guess what? You don’t really care do you? You can’t even convince your spouse, your parents, your children, your siblings to do what you do (invest so wisely! ), so you release your pent up pseudo-knowledge to your unsuspecting acquaintances and casual friends? You won’t risk damaging the relationship of your best friends, would you? Of course you meant well! Who doesn’t? But will you compensate the losses of your “friends” who followed your recommendations? I didn’t think so! Help only those who are ready to help themselves. Or in your own backyard first. I was fortunate to grew up in a 3 generation family. My maternal ah ma was the only surviving grandparent I knew, and she stayed together with the other 5 of us in my dad's tiny HDB 3 room flat in Queenstown. Ah ma was the good cop; while mom was the bad cop. Mom likes to scold and cane me (I'm always up to some mischief! ), while ah ma would secretly defy mom by buying me soft drinks (my favourite!) and toys. And we would always say: "Don't tell mom!" with a wink and a smile. Ah ma was my best friend during my early childhood. We spent lots of time together, especially when I only attended kindergarden for one year. As a middle child, I was the "invisible one". I guess looking back and knowing what I know now, that's why I was so naughty! I was seeking and craving for my parent's attention. Luckily, ah ma sees me and is always there for me. I followed her when she goes for her morning walks, marketing in the wet-markets, and doing little errands for her by buying cigarettes (now not allowed) and going into the neighbourhood provision shop to find out the "chap-ji-kee" results (written on a calender). Sadly, ah ma passed away when I was doing my basic military training during national service. Each time I came back to Singapore for home leave during my 7 years away, I would make a visit to Mt Vernon to say hello to ah ma within the next 1-2 days after arrival. It's all very natural and impromptu. There's no waiting for an anniversary or being reminded it's that time of year we all "have to" do what's expected of us. Deep down we know the reasons why. Money is indeed helpful; but it can't buy that kind of bonding.